Looking for itemized invoice templates? We've got you covered! Do I need more than just a itemized invoice template? An itemized template invoice is an invoice where all the details are laid out for your customer. For example you want to give them enough detail so they don't question to total amount but not enough detail where they understand the margins of your business and try to squeeze you. Itemized invoice templates are what you are after and at ZipBooks that is exactly what you are going to find. 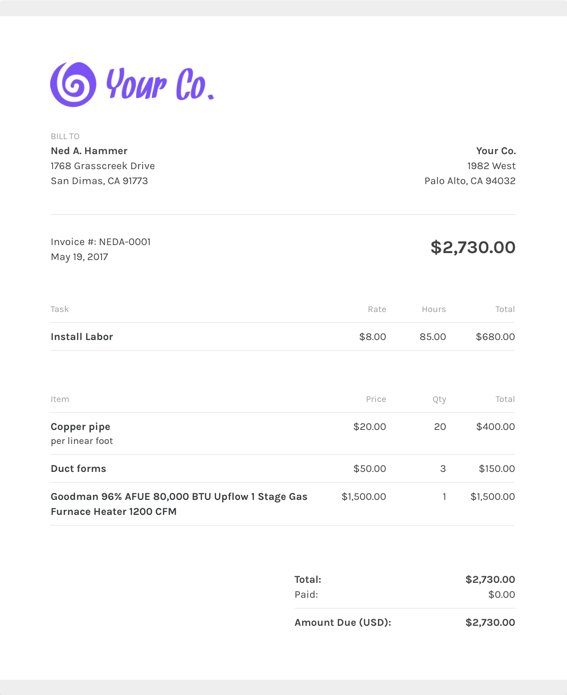 It's free and easy and hey if you use our invoice template to create an invoice isn't that by definition a handyman invoice template? What should I include on my itemized invoice template? One great feature that ZipBooks is that you can save default settings for your invoices once you nail down the invoice details. Using ZipBooks for your itemized invoice means never sending off an invoice without your own company’s information on it (oops!). We’ve collected data from tens of thousands of invoices and use it to score your invoice based on what information you include so you’ll get you paid faster. Using ZipBooks for your itemized invoice means never sending off an invoice without your own company’s information on it (oops!). We’ve collected data from tens of thousands of invoices and use it to score your invoice based on what information you include so you’ll get you paid faster. Why should I use ZipBooks’ itemized invoice template to create and send my itemized invoice?